Breathing is a small step towards new art forms in which subtle processes of organic and non-organic life may reveal invisible patterns that interconnect us. Breathing is a work of art based on a hybrid creature made of a living organism and an artificial system. The creature responds to its environment through movement, light and the noise of its mechanical parts. Breathing is the best way to interact with the creature. 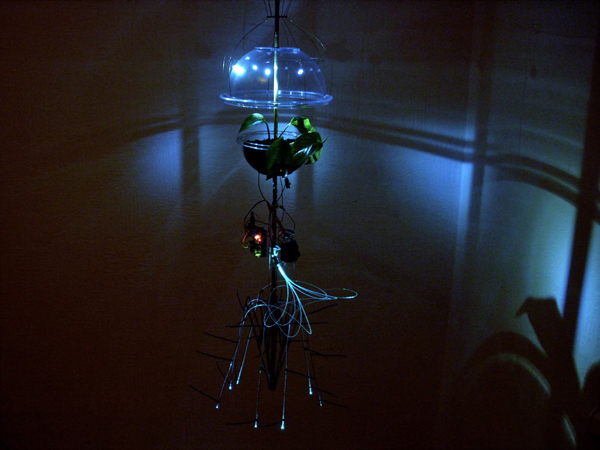 This work is the result of an investigation of plants as sensitive agents for the creation of art. The intention was to explore new forms of artistic experience through the dialogue of natural and artificial processes. Breathing is a pre-requisite for life, and is the path that links the observer to the creature. Breathing is a work of art driven by biological impulse. Its beauty is neither found isolated on the plant nor in the robotic system itself. It emerges at the very moment in which the observer approaches the creature and their energies are exchanged through the whole system. It is in that moment of joy and fascination, in which we find ourselves in a very strange dialogue, that a life metaphor is created. Breathing is the celebration of that moment. Breathing from Guto Nobrega on Vimeo. Guto Nóbrega received a Ph.D. in interactive arts from The Planetary Collegium programme (former CAiiA-STAR) based on the School of Art and Media, University of Plymouth – UK (2009), where he developed research under the supervision of Prof. Roy Ascott. His doctoral thesis, funded by CAPES – BRAZIL, is a transdisciplinary research in the fields of art, science, technology and nature in which he investigates how the confluence of these domains (specially in the last decades) has informed the creation of new aesthetics experiences. As a result of this study it was developed a theoretical-practical intervention in the field of arts with focus on the ideas of interactivity, telematics, field theories, and hyperorganisms. He has been developing series of artworks which encompasses drawings, photos, videos and robotics systems. He is artist and researcher with MA in Communication, Technology and Aesthetics by ECO-UFRJ – Brazil (2003) and is Bachelor in Engraving by the Escola de Belas Artes – UFRJ – Brazil (1998). Since 1995 he lectures at the UFRJ-Brazil where currently he holds a position as Adjunct Professor and coordinates the NANO – Nucleous of Art and New Organisms, a research lab and group for exploring the intersection of art science and technology. His works have been presented widely in exhibitions and conferences such as: Arizona College of Fine Arts -Arizona US; ISEA Singapore; University of Quebec in Montreals Coeur des Sciences; University of Applied Arts Vienna; Sala Parpalló – Valência Spain; LABoral – Centro de Arte y Creación Industrial; Gijon Spain, Facultad de Ciencias Sociais y Comunicación Universidad del País Vasco – Bilbao Spain; International Institute of Biophysics Neuss Germany; Roland Levinsky Building, University of Plymouth UK; Art Centre Plymouth UK; Barbican Theatre Plymouth UK; Cornerhouse – Manchester UK; TRANSITIO_MX04 – Mexico; TRANSLIFE – China; Universidade do Porto – Portugal; IT University of Copenhagen – Denmark.